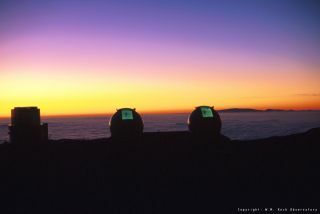 Photo of the Keck I and II domes at sunset, used as cover art for the award-winning DVD "The Kecks of Mauna Kea." The W.M. Keck Observatory atop Mauna Kea in Hawaii is a renowned astronomy shortstop. When scientists see an exoplanet or other interesting finding in a telescope, Keck is often used to confirm it. Sometimes, of course, Keck leads the way itself. Over the years, Keck has worked with other observatories to figure out more about the universe around us. Its top discoveries span anywhere from the Earth's solar system to the outer reaches of space. From measuring the redshift, or movement, of galaxies near the edge of the universe, astronomers figured out that the brightest galaxies were probably formed about 2 billion years after the Big Bang, the event that likely sparked the universe. (Older galaxies tend to move faster.) Keck contributed to the multi-observatory discovery by detecting the spectrum of hydrogen gas that was perturbed by nearby stars or released by galactic black holes. Keck and several other telescopes peered at supernovas, which are star explosions, to chart the rate at which the universe is expanding. Measurements indicated the universe's expansion is accelerating, fuelled by a mysterious process called "dark energy." One big question concerning Earth's formation is how the water got there in the first place. Scientists using Keck and NASA’s Spitzer Space Telescope said they were a step closer to understanding water in early solar systems after finding water vapor in two extrasolar protoplanetary discs. "While we don't detect nearly as much water as exists in the oceans on Earth, we see only a very small part of the disc — essentially only its surface — so the implication is that the water is quite abundant," stated paper co-author Geoffrey Blake, a planetary sciences professor at the California Institute of Technology.